As Chrysler prepares to sell the Viper brand, it seems that Viper enthusiasts are sticking with their beloved snake in hopes that its pedigree remains untainted due to a sale. This is the type of following we can only hope to have at LM for all of our models. I've read the article and perused some of the forums and the enthusiasm is very encouraging, so I thought I'd share it with those that may already be die hard LM fans, and for those that soon may become devout followers of our brand. I don't think people would be too up in arms to see a mini van model or most sedans vanish from production lines, but with cars that are inspired and offer the customer something that they can't get anywhere else, they will stop at nothing to protect the designs they love so much. In working with the data obtained from scanning the transmission, we have discovered several ways to tailor the output from the ZCorp Scanner and the RapidForm XOR software to suit our needs in building our prototype. One of them is shown below. The scanner did an excellent job picking up the detail of the transmission, which in a perfect world, we'd like to retain. The software is very capable of doing this. 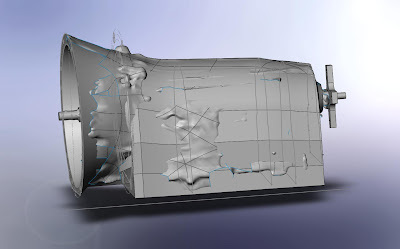 However, based on our time line, and what we need to do with the scanned data (represent the spatial constraints of the OEM parts and mating them to the chassis/other components) it isn't necessary to use every detail of the scanned data in the transfer to a SolidWorks model. What I discovered we can do to represent the scanned data in a usable format and still represent the model as a solid recognizable by SolidWorks and able to be mated to other components is to capture the main features we need as a parametric solid with data that can be referenced and further edited (if necessary), and also represent the geometry as a surface all in one part. What this means is that we can turn the surface data and solid data on and off as needed without having to load two separate models into SolidWorks and toggle between the two of them and then have to figure out where the differences lie. This will be especially useful in areas where parts may have limited space between them and although the solid we create based on the scan may not capture all of the detail, we can turn the surface data - which is a direct representation of what the scanner picked up - on and off to check clearance. 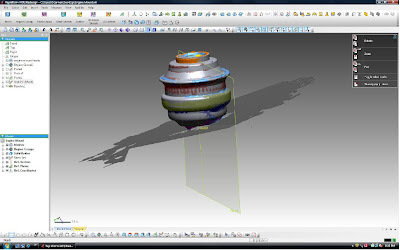 Using this method, we can create the bare minimum amount of data we need to load the part in SolidWorks and mate it to other parts, and represent the rest with a feature in RapidForm called "Auto Surface," which quickly models the regions as a surface model. Although it isn't always a clean surface (this depends on how much time you spend cleaning holes and imperfections in the scanned data), it usually does a good enough job to represent the outer extents of the parts, which is the main thing we need to have. As we use the software more and more we will continue to find these types of attributes and how to tailor them to our needs to quickly and effectively develop prototypes. Here is the transmission in RapidForm. The colored areas are the regions of the scanned data, and the gray, smooth area in the main body of the case is a solid made from a cross section of the case as per the scanned data. Here it is in SolidWorks with the solid and the surface data shown at the same time. As you can see, the solid data provides a quick way to represent the general shape of the transmission and allows you to mate it to the engine, drive shaft etc. while the surface data can be used as a check to make sure the finer details of the transmission (which would take a fair amount of time to create) do not conflict with any parts that may be located near the transmission. 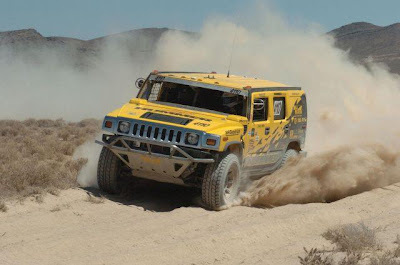 Here's an article about the Rod Hall Team HUMMER, and their sweep of the production class in the Vegas to Reno "Best in the Desert" race we attended late last week. As the article states, the race can be an arduous task, especially when one of your wheels gets ripped clean off, never mind when things go "smoothly" (the track is nothing but!). This explains why on every truck we saw, teams go as far as carrying not only two spare wheels/tires, but also spare suspension parts like control arms - the terrain can be that rough. You'd think that if you had to go that far to make a repair, that you'd be out of the race and have to pack it in...not so, as Team HUMMER demonstrated in their run for the sweep of the production class. This is a class that we looked at very closely, not just the all out Trophy Truck class. Analyzing the trucks in each class gave us an idea of the most extreme build and one of the "simpler" builds, which required stock suspension. The production class is one that we could possibly compete in, so it's good to see that stock parts can handle this terrain, since some of the parts we will use as "stock" could very well be improvements over what your typical stock suspension would be comprised of. It's No Mistake Why They're "The Best in the Desert"
As Jay has already mentioned in his blog, the vehicles that enter this race from the dirt bikes, to the quads, to the Pre-runners, all the way up to the Trophy Trucks are the real deal. Especially in the case of the Trophy Trucks, these vehicles are as purpose-built as they come. Although we will not be trying to directly mimic the construction and as a result, the performance of the Trophy Trucks in our first vehicle, it was great to see what the top notch, function over form, best in the game trucks incorporate for drivetrain, suspension, interior, chassis etc. Despite this fact, the mission of our trip was accomplished since now that we've seen how these trucks are made first hand and spoke to the guys that design, build and race them. What I mean by this is that although our vehicle will have to take a different route in terms of construction due to other parameters we need to meet that the Trophy Trucks do not (FMVSS standards, mass production - think thousands, not millions, but not only one either, visibility, comfort, etc. ), we can still use some of the properties incorporated into the construction of the trucks to manufacture a vehicle like no other on the market, and one that may not be able to demolish one of these trucks out in the desert, but run with the pack. And from what we saw this weekend, just running with the pack and being able to finish says a lot. One excellent example of a feature that proves these vehicles leave nothing behind when it comes to being built for performance is a certain element of the chassis that is a minor detail, but one that allows big performance gains. It's also something that we could incorporate into our chassis for better performance, without limiting our goals of efficient production (both in cost and time). It's something I hadn't noticed in the pictures I had seen on the internet, but found it to be common on just about every truck that I saw on the tech inspection day. You will notice in the photos below that around each bolt is a piece of round tube used as a gusset (center of the photo as pointed out by the arrow). In the case of the rod end mount, there is a tube welded to the gusset and then to the spindle for added bracing to handle the intense loads the suspension will see as the truck flies across the desert at an average of 70 mph (sometimes reaching over 120 mph) traversing some of the toughest terrain you can think of. As for the control arm bolt in the second picture, the bracket that welds to the main portion of the chassis that the bolt goes through could be braced by a single piece of steel at the top or the bottom, but you can see that instead, a round piece is welded to the bracket, around the hole for the bolt, then it is gusseted by sheet steel (Lower end of photo, near center as pointed out by the arrow). This allows for an incredibly strong mount, and because the stock is a round piece, you can still get a socket onto the nut/bolt. Again, in the critical areas, this is a subtle detail found on the best performing trucks in the world that could easily transfer to the LM vehicle to adapt as much of the performance of a Trophy Truck into the vehicle as possible, without hindering our other manufacturing goals to a fault. Our engine for the prototype arrived!! This is like Christmas for car guys all across the globe. We've been receiving parts for some time now, but this was like that one big present in the corner staring you down on Christmas that you know you want to open first, but your parents make you save it for last! No pesky parents around today to stop us! We barely had it in the door when we took the wraps off to take a closer look. You'll be seeing many more pictures of this beauty as we traverse the development process, so stay tuned. Take a look at the fixture they ship it in by the way - not your standard cheap wooden crate. A sign of quality for sure. As I mentioned in my post the other day, integrating a Segway into our model could be one way to address the "last mile" or allow customers to achieve the elusive 100 mpg lifestyle many people are after in today's world of high fuel costs. Therefore, through an agreement with the people at Segway, we have an X2 on loan, so of course, as soon as it arrived we put it together, made sure it had a charge and hit the streets (and did some off-roading too). Unfortunately, the whole team wasn't here to take advantage of the initial test drive, but there will be plenty of other opportunities! Dave tries his hand at putting the X2's off-road capabilities to the test. Michael negotiates the elevation changes (and some bumps) in the parking lot. Priyanka buzzes by the building, smiling ear to ear the whole time. After letting Michael and Priyanka try their hand at operating the X2 for the first time, I also decided to go off road. It seems that yet another great concept (at least some of the great aspects of it) from one of the major auto manufacturers is going to be left behind in the transition from concept to reality. Car and Driver reported today on their site that many of the features of the Chevy Volt that made the concept both fresh and exciting will not transfer into production. 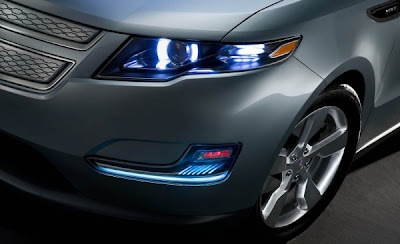 From the sneak peeks, it looks like the Volt is taking a Lumina, Impala, Malibu etc. turn and becoming comfortably numb. This is particularly evident in the grill opening which had quite an aggressive look, now it's just "ehh". This happens all too often. If Local Motors is ever guilty of going from aggressive to "ehh" in the concept to production it will because the blood running through our veins has run completely cold. Enter the flying pigs. Sure some things will change as we progress into production, but as I've mentioned before, the agendas of the larger auto makers often force the type of change in the Volt that we simply do not and will not (ever) have. As I've discussed previously, the "last mile" issue in transportation has become more and more of an issue with the rise of gas prices, and population of urban areas. Therefore, several devices have surfaced. Few have the market presence of the Segway, despite its lingering image of being less than cool let's say, as depicted in an article Ari forwarded to me today from Popular Mechanics. To name just one of the others, the Toyota "Winglet" has also garnered some serious attention in the press/on the internet in its own right, and does offer a viable solution to the "last mile" issue, but I think being hands free will be even more of a barrier than cool looks, which I think it has over the Segway in some aspects. Having said that, as both of these machines become more visible (more people purchase them in an effort to adapt to the issues we now face and will continue to face for the foreseeable future) I think these initial perceptions will die off. Also, having used the Segway myself on a recent visit to their headquarters, and as the article points out, it is a ton of fun to ride. It's REALLY fast and very intuitive to use too. I especially like the off road version, particularly for those future customers of ours that may be taking the Rally Fighter off road and may want to conduct some further off road exploration into places that the Rally Fighter won't fit. Or, for those that use it in everyday use, when they park the Rally Fighter, they'd like to get from the parking lot to their destination quickly! Therefore, thoughts of integrating one into the vehicle as I mentioned in a previous post have re-entered my mind so I pose the question, how much would having an integrated X2 Segway in the Rally Fighter influence your purchase decision? Although we did receive more parts today, and some pretty significant ones like fuel tank and transmission, I was not able to scan them in. The good news is that the reason why I didn't have time to scan them was that we were very busy today making some critical decisions on how to proceed with the design process, specifically the milling of models and with whom that work would be done. Pairing the guidance of potential suppliers, advisers and our industry connections with our instincts on the best methods for our business model (meeting time, budget, scope and what we can learn from doing things a certain way) we were able to formulate a plan. We feel this plan is an effective combination of industry standard and methodology that will again, allow us to meet our goals and do so in a way unique to LM and one that will allow us to continually develop new designs like no other auto manufacturer, whether work be outsourced as in this primordial development process, or brought in house for future builds. Over the last few days, drive line components have begun to arrive, and we have started the cataloging process by scanning them, then using RapidForm to transfer them into parts that can be recognized in SolidWorks. The first of these parts was the engine mount as seen below. 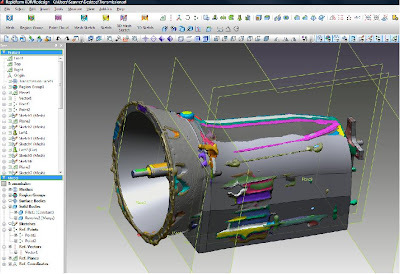 What we've found from the training sessions and from practicing on other components is that the best method is to disassemble parts to the lowest level and scan each part individually, then put the models back together in the SolidWorks environment as an assembly of multiple components just as they are in physical form. In the case of the engine mount this is pretty easy since there are two parts to it: the mount and the heat shield. 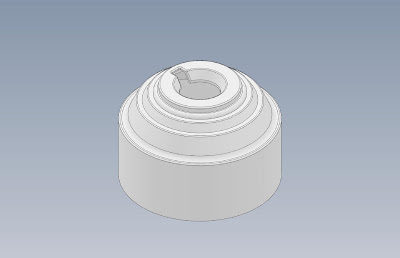 Because the mount has some complex geometry, I scanned that in to be sure that I captured the detail, but since the heat shield is a simple part that's easily modeled by extruding circles and apply some radii to the edges, I reverse engineered that right in SolidWorks. This hybrid approach is a method that will be commonly employed during the development process. As we continue to model parts I will be sure to post the results, especially for some of the more interesting and complex components. Perhaps if Shakespeare were a designer or an engineer, the famous words wouldn't have been "To be or not to be" but "To scale or not to scale". I ask this because when it comes to automotive prototype development, it seems that the common method of milling a design for the first verification run is to mill full scale foam or clay with the the secondary method (often when time and cost are a factor) involving milling a scale model, usually 1/4 scale. Since we are in the phase of developing not only our first prototype, but devising an innovative method of developing such prototypes, we had a lengthy discussion today on following the first inclination of milling at full scale, the secondary method of 1/4 scale, a combination of both, and even milling to a different scale before milling our final full scale model, from which the first tool will be made. As Jay stated near the end of this conversation, it would be great to have a Wikipedia entry on the matter that we could simply look up and base a decision on, but the fact of the matter is that it doesn't exist, so we can either follow the current industry standard to the letter, make a total departure from it, or develop a hybrid method. Once again, these are the types of discussions we have daily here at LM, which I don't think current manufacturers have anymore and although it can be very difficult to come to a common and correct conclusion at times, the discussions are both necessary and invigorating. Maybe the path we blaze will have some wrong turns in it, but as long as we learn from such wrong turns for our next vehicle, our success won't falter, but we'll be in a better position for future builds having the best route mapped out. This reminds me of another famous line: "You have to lose to know how to win." In other words, in terms of our process, we may do more work or go to an expense more than is necessary, but as long as we recognize this early, and we are willing to experiment and stay flexible we can make the necessary adjustments to our process to become more time and capital efficient the next time we begin development. Once we combine our learnings from doing things the way that work best and the ways that don't work so well we'll have to write our own Wikipedia entry on the matter. Today I read an article about Porsche #1 making its way to the famed Concours d'Elegance at Pebble Beach. I didn't find the fact that the car is being shown as a celebration of Porsche's 60th birthday nearly as interesting as the details that followed this announcement regarding the history of the car and being car #1, the history of Porsche's early development. The Porsche story is actually very similar to that of Local Motors. Mainly, Dr. Ferdinand 'Ferry' Porsche developed the first car after an unsuccessful search to find the car of his dreams. We are working under the same premise and will be producing cars like none other available on the market. Also, like our first prototype the first car utilized running gear from an already existing platform (the VW). It also used the suspension, headlights, clutch, gearbox, cable-operated brakes, and steering from the VW in addition to the engine and transmission. Using these parts allowed Porsche and his team to focus on things like tuning the engine for more power, but the thing more in line with the LM model, creating a new body design. 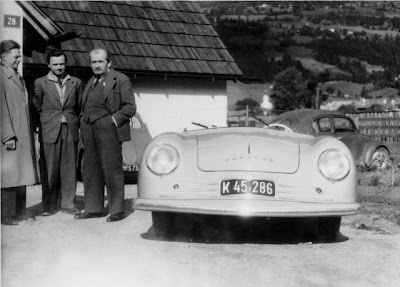 "Erwin Komenda, who along with Ferry Porsche and Karl Rabe formed the foundation of the fledgling car company, penned an aerodynamic and easy-to-build open roadster design. Friedrich Weber from Gmünd, one of just three of the company's body artisans, formed each of the car's aluminum body panels by hand, beating the then rare sheet metal and massaging it into shape over the wooden body buck Komenda had designed. The result was as shapely and beautiful as it was functional, with minimal protrusions to upset the aerodynamics or its visually graceful lines." Another parallel to the first Porsche is that he kept the car simple and still achieved a high level of performance wrapped in a beautiful, timeless design. The car had only what it needed - a result of function driving form as is still the case with modern Porsches. I always find it interesting how humble the beginnings of most of the major players in the automotive world are, this being no exception. I think it just provides proof that even in today's age of car building, when you're driven by design (or lack thereof in cases like Dr. Porsche and LM), and you carry that tradition in every model you produce, the results can totally change the game. So the announcement has been made...the Rally Fighter it is! Now that we have determined which vehicle we will proceed with, one of the first things we have to concern ourselves with is the occupant packaging. This will drive not only the interior design (the details of which will come much later), but the roof line, the location of the chassis components, drive line, ingress/egress etc. all of which have an immense impact on the vehicle design. One way to ensure that we leave enough room for the passenger, chassis, drive line etc. is to create an orthographic drawing - which I've mentioned in a previous post - and include in that drawing a model of a human, usually a male that fits the 95th percentile of most males to ensure that we will be able to package the vast majority (95% as the term suggests) of our target audience. Designing anything to meet 100% of all possible scenarios is not only very time consuming and very costly, but referred to by the term "over-engineering". This is something that all engineers and designers consider no matter what it is they are designing. Just about any product you can think of is designed with this principle in mind. Now, of course if someone outside of the range can still use your product despite not being able to do so quite as well as someone in the 95% range, that is obviously an added bonus. This is always tough with automobiles compared to say tooth brushes or razors, particularly in the area of occupant leg room and head room. 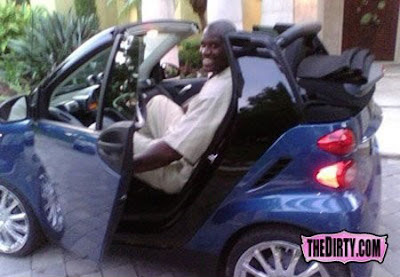 We'll be aiming to meet this 95th percentile mark, and do so allowing the passenger the most comfort possible, although if we can't fit someone like Shaq in the car it would be a shame, as you can see below. Which vehicle have we chosen as the first LM prototype you may be asking. Or one of the great designs in a community member's profile? Well, work has begun on the prototype, but I can't say exactly what it is just yet, so you'll have to remain in the dark, just like Dave and Dan working on the prototype in the image below. However, the wait is over tomorrow August 5th!! See our website for the exciting announcement, and stay tuned to the Vehicle Engineering Blog for more photos and information on the days leading up to this historic day in automotive design and engineering. Over the last few days we have had many in depth discussions on our first design. These discussions have included the body design, chassis engineering, occupant packaging and several other topics. After working well into the night (the morning actually) the other night with Jay and Dave a thought occurred to me as I was driving home. No matter how much we're discussing the physical deliverable of this prototyping phase, the conversation always has an underlying common aspect. That is of course that the physical product we will develop isn't the only deliverable from this process. We must also develop a new way of manufacturing that product that differentiates us from all other auto manufacturers. The thought I had wasn't just this, but that I wonder if these discussions - debates if you will at times - will continue with every new product we develop. The process may be the same (or near the same) vehicle to vehicle, but I hope that the discussions continue to carry the same weight as they do now and everyone puts in their thoughts and efforts like there is no chance for failure and everything is riding on that one design. I think this is something that USED to happen with the existing auto manufacturers, but they lost it somewhere along the way.